Given a choice between an incentive package or the ability to enable their employees to better achieve the American Dream, which would business executives choose? Hopefully it is a provocative question. Many communities feel the only way they can compete for company attraction and protect against company “poaching” is to rely on competitive incentive packages. But, the return on investment of incentive packages has come under serious fire recently. Both the NY Times and Richard Florida have published articles that suggest incentives are not effective and their use tantamount to giving away tax payer dollars with no expectation of a positive ROI. 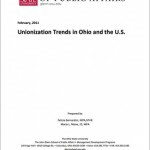 Economic Development Organizations and communities are very reluctant to not include incentives as a component of a site selection deal, in part, because they are convinced that when it comes down to the final decision the size of the incentive package can be the difference between winning and losing. But, what if there was an alternative to incentive packages? Something business executives valued as much or even more; something that would potentially benefit all employers in a community rather than just the company looking to set-up or expand their operation in the community. Something that would actually help the community be even more attractive as a place to do business from? If that “something” existed, it might have the potential to eliminate the need for incentive packages in economic development. The Burghard Group believes enabling people living in your community to better achieve more of the American Dream may actually be that “something”. The American Dream Composite Index (ADCI) represents the first measurement that quantifies the American Dream in its entirety. It is a survey-based index that gauges the level of how well people living in the U.S. are doing at achieving the American Dream. The ADCI is based on a scale from 0 to 100. The research method has been statistically validated and the ADCI score is updated monthly. There are 5 dimensions (or sub-indicies) that are reported to help provide additional insight into the level of achievement for different aspects of the American Dream. The five dimensions are the 1) economic index, 2) well-being index, 3) societal index, 4) diversity index and 5) environmental index. The ADCI was created by Xavier University. It is currently published on their website as a national index. I believe the ADCI is a good measure of the authenticity of Brand America’s promise. 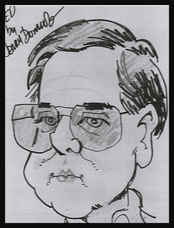 It is that belief that motivated me to initiate a discussion with the team at Xavier University and led to the monthly publication of the ADCI on a multi-state regional basis on the Strengthening Brand America website. The Burghard Group has launched a survey among business executives to better understand the role the ADCI score could play in site selection decision process. 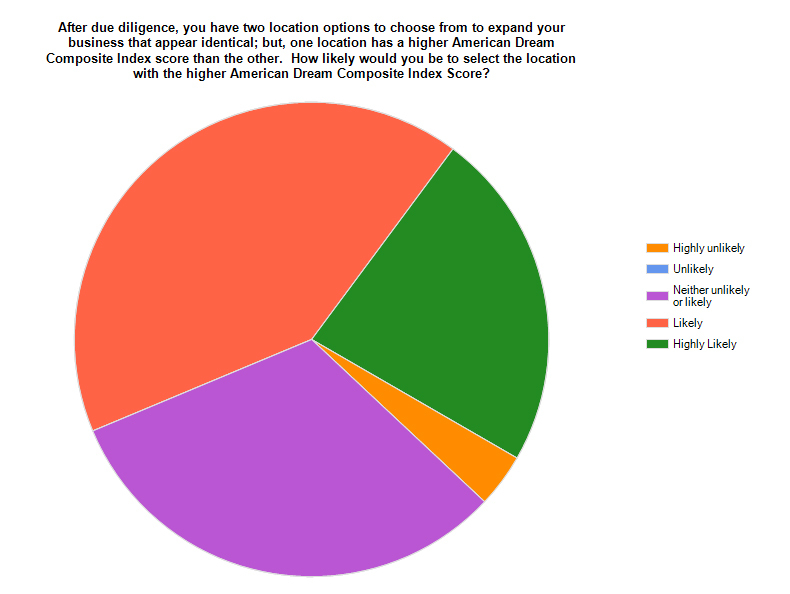 The survey findings regarding the perceived importance of the ADCI and benefits to a company from their employees working in a community where the American Dream is more easily achieved were shared in my first post [http://strengtheningbrandamerica.com/blog/2013/01/is-ability-to-achieve-the-american-dream-the-new-goal-survey-results/]. Can the ADCI score break a tie between competing locations? 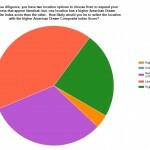 These data suggest the ADCI score is indeed capable of being the deciding factor in a site selection decision. 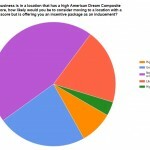 Can a high ADCI score offer protection from losing a company to competitive communities offering an incentive package? 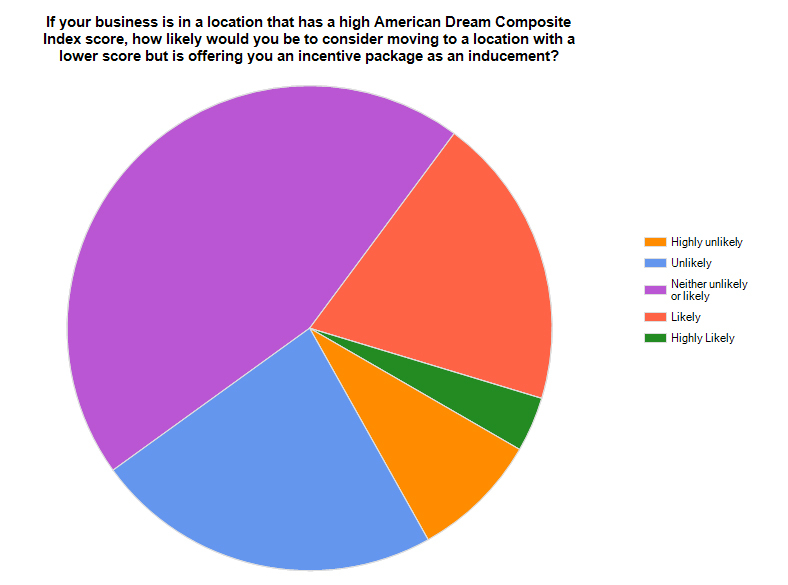 In fairness, 23.2% of business executives would be “likely” – “highly likely” to consider relocating their company for an incentive package even though their employees may not be able to achieve the American Dream as easily in the new location. A high ADCI score is not a guaranteed barrier to losing an employer, but it is a deterrent for more rather than less. I think the take away from this study is that the ADCI warrants a closer look by communities that want to be more competitive for capital investment deals. A higher ADCI score appears to offer the potential for a competitive advantage and as a way to win more closely contested deals. How you can use the ADCI (and sub-index) score to help inform the strategic investment choices made by a community should be explored more deeply. 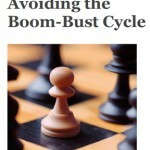 It will definitely be an area of focus for The Burghard Group in 2013. 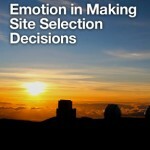 As soon as ADCI scores for states (and eventually major MSAs) is published; then, based on the study results, you can expect business executives will begin taking the score into account when making site selection decisions. The development of economic is the most important thing for the country to be well developed and prosperous.